Pseudophilotes abencerragus is one of the smallest butterflies in the world. 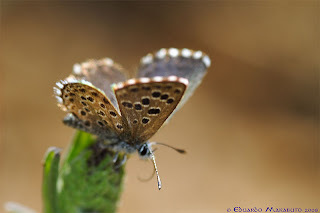 This liliputian butterfly is as small as it is rare, found only in very few places in Portugal, Spain and Morocco where its colonies are very local and butterflies fly in rocky places with sparse vegetation, which constitutes their habitat. This is a highly stenochorous species as they fly around the foodplants and little more, not going much further than a couple of meters away. 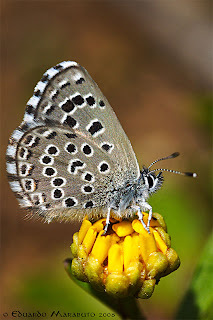 In Portugal this rare species is to be found mostly in the Algarve, with scattered populations elsewhere. 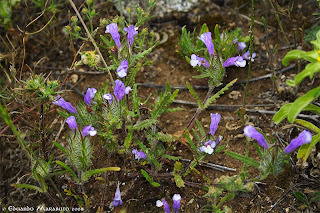 Their caterpillars feed only on the smalish Cleonia lusitanica, from the rosemary family. This was photographed in Baixo Alentejo, Portugal, in a newly discovered colony, found only last year. Como sempre nem vale a pena falar das fotografias, muito bom. Fico feliz por ver jovens tão talentosos. Aguardo sua visita ao meu blogue, BioTerra.